Which happen so be . . .
Now, Onto Wednesday . . . . So obviously, what I mainly worked on this last week (frantically trying to finish in time :) was the Lone Star Quilt for my Grandmother :) And with being out of town for the weekend, I haven't gotten much else done. My Grandmother has made a quilt for every single grandchild for their wedding. I was the first to receive mine. Grandma individually french knotted and quilted by hand each corner of gingham to make these beautiful patterns. And in the 11 years since I was married she has made 27 of these beauties. So I figured it was high time someone made one for her. Over the next week I started to add in the inset pieces of background. This is where I hit a snag. The instructions we were given was to measure the opening on both sides, average it, and then cut a piece that size to insert and ease in the extra. Unfortunately, my sides and easing did not want to agree and my triangle inserts were great on one end but came up short on the other end. So that is the tale of Grandma's 80th Birthday Quilt. I so enjoyed making this quilt for my Grandmother. And I so enjoyed watching her receive it. And ya, I was crying ;) (To bad my batteries were dead on my camera at that point) Love you Grandma!!! Happy 80th!!!!! So this weekend we took a little trip up to Salt Lake to celebrate my Grandmother's 80th Birthday. It was so much fun to spend time with family and the entire weekend was a whirlwind. And to top it all off, my mom came down with us for an appointment and is spending the day with us. Yippee Skippee!!! Here is a close up of the quilting. I did echo quilting of the shapes in the white space. This was so much fun!!! The idea is that no matter how rainy or gloomy a day seams, there is nothing like a bit of sewing to turn the day around and make everything rosy :) And Linda loved it!! She sent me the sweetest email with her appreciation and her words so made my month!!! Sweet words like that remind me of why I loved all of this online quilting craziness :) So basically, things couldn't have worked out more perfect!!! 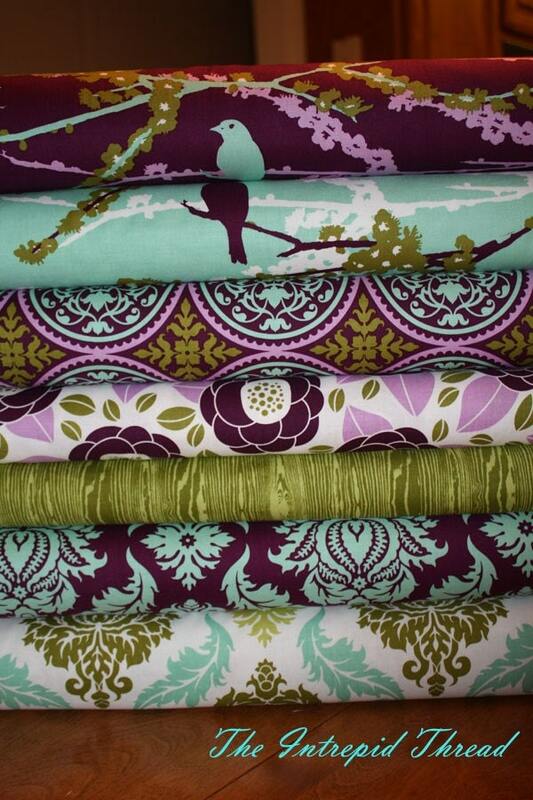 I am so excited to welcome Studio Kat Designs as Happy Quilting's newest sponsor!!! Kat carries amazing purse patterns designed for the way women Really are!!! And her bags are truly Art you can wear! All of her bags are fabulous and there is sure to be one that fits your needs just perfect. Like maybe this one?? Kat also carries all of the notions that you would need to make up your fabulous purse. Talk about one stop shopping!!! Thank you to Kat and Studio Kat Designs!!!! I am so happy to have you as a part of Happy Quilting!!! So how about a little giveaway to welcome our newest sponsor!! Kat has graciously offered one lucky winner, not 1, not 2, but 3 of her amazing purse patterns. Yup, one lucky winner is going to win all 3 of these!!! 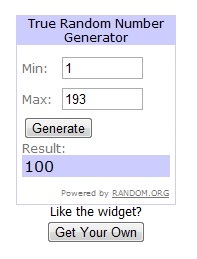 So that's it, easy enough right :) The giveaway will close on Tuesday the 28th and I will announce a winner on Lucky Leap Day!!! Good Luck to all and Happy Quilting!!! For the Sew. Bee. Create Bee Bethany is making a super cute blue and green quilt and gave us a choice of 4 blocks to make. I liked this block layout. The block is 12" finished and those 5 little guys are 2 1/2". I really like piecing on a small scale lately. It is just so fun!!! For the Beejeebers Bee Linz asked us to do a 16" block representing a family friendly game. She is doing a game night quilt for her family. What a great idea, huh!!! I choose Monopoly. I had so much fun putting this block together. And boy oh boy, did I get to use my Slice a lot. Don't you just love those little trains. They are 1" :) So cute!!!! So I have been playing with this super adorable fabric over the last little bit. It is Ten Little Things by Jenn Ski and I am putting together a little bakeshop tutorial for it. This little pile however is now in my scrap bin. Why you might ask. Because I broke one of my cardinal rules and did math late at night. It seems whenever I do that, I tend to make errors. As was the case here. I figured the size of these squares wrong and so they are all 1/2" to small. One of these days I will learn. Does this happen with any of the rest of you or is it just me that has a brain that shuts off at 9 pm??? 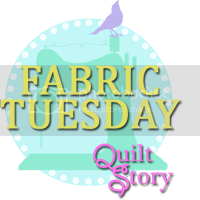 Hi, I'm Pat from Color Me Quilty! I am beyond excited that Melissa has invited me to show you this tutorial for Gothic Windows. I hope that you will all like making this block. Gothic Windows. 8"x 8" finished (8 1/2" x 8 1/2" as it is here). Believe it or not it can be made with 3 contrasting Jelly Roll strips or (3) 2 1/2" wide by the width of the fabric strips. 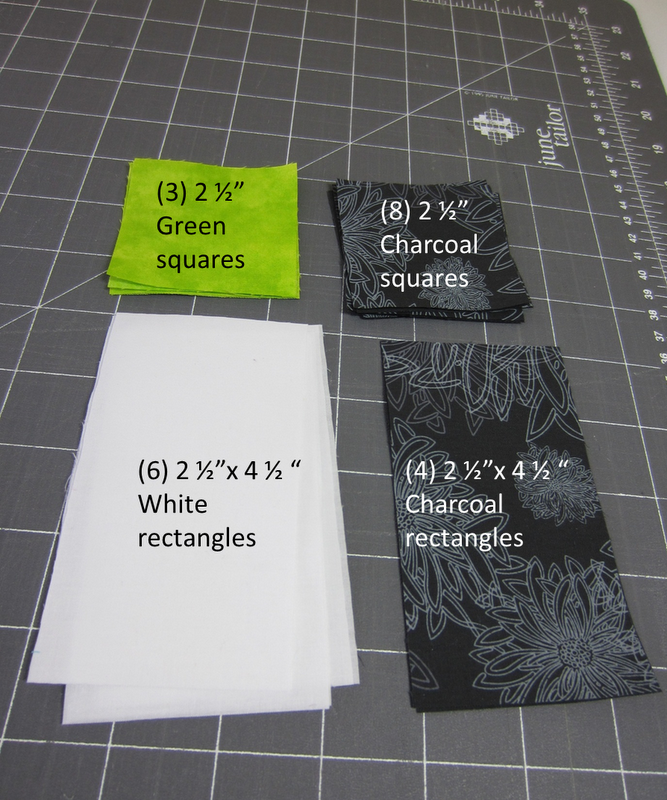 Fold all six of the white rectangles in half (right sides to the outside) and sandwich between the charcoal squares and rectangles. White sandwiched between two charcoal squares. Align the two edges of the white with the edges of the charcoal squares. The folded edge should be approx. 1/4" short from the other edge of the two charcoal squares. 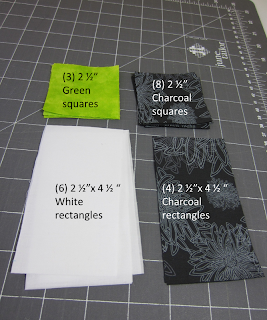 Do the same with the rectangles with the exception that one side with have additional fabric. You can chain stitch the blocks, if you wish. Then just cut them apart. A perfect one seam flying geese (or is that goose??) Press!!! You should end up with 4 short and 2 with longer sides. Stitch two of the short geese together. Put the green square in the middle, evenly spaced (it will be smaller that the white). Fold the white edges down and press. Voila! you have the center done. Next you will be doing basically the same thing with just the flying geese. Since these geese are not sewn together, you need to stitch a very scant 1/4" across the bottom to hold the corners of the geese down and to hold the green half square in place. This line of stitching will not show once your block in assembled. Do this will all 4 of the remaining geese. Can you see the glue? Repress to set the glue. This will NOT gum up your needle when you stitch. You can use either the liquid or the glue stick. I've used both on different projects. Top stitch the two side of the triangle. Start to assemble by adding the two short geese, one on each side. Add the two longer geese to the other sides. You now have completed a Gothic Windows Block! I hope you've enjoy my tutorial. 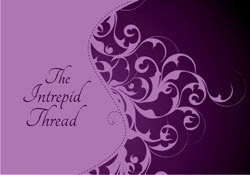 Thanks again to Melissa for letting me guest blog.